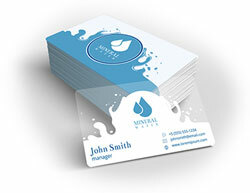 Creative paper stock gives business cards a special look and feel that makes people say "ooh!" And when people notice your business card, they notice you too. Premium papers comparable to brand name designer papers. SmartFlex®, a synthetic material that's water resistant, tear resistant, heat and stain resistant, and 100% recyclable. Special order papers in any almost thickness, texture or material you want. We can custom order specialty papers to create a business card on nearly any type of stock you want. Custom paper stocks cost more and usually aren't cost effective for small orders. 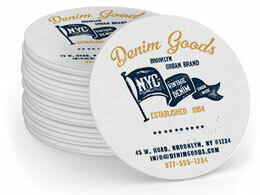 But they can be an exceptional branding piece for larger businesses that need cards for multiple employees. Use design elements that enhance the paper's qualities. Use the see-through aspect of clear cards. Pair linen with elegant touches like embossing. Clean, uncluttered fonts and type that's at least 8pt in size will make your business cards easy to read. Business cards have been around for generations, but there's no reason that yours should look like your grandfather's. With creative paper stock, you can create a card that feels fresh, new, and uniquely you. Your name and job title. Your phone number. Include your direct line and cell if you use it for business. Your email and web address. Links to your social media accounts. Only include networks where you're active in your professional life. Consider including your photo. People remember faces far better than they remember names, and a photo helps people connect your card with the conversation you had at a networking event, seminar or trade show. Use creative paper stock to give cards an unusual texture. When people feel something different in their hands, they naturally want to explore it further. While they're running their fingers over your intriguing card, they'll also be absorbing your name and what you do, increasing the chance that they'll remember you later. And unique business cards make great conversation starters. Creative use of paper can help promote your brand. A professional services firm might convey dignity and old fashioned values by using linen, while a design firm might show its creativity with a funky textured stock. SmartFlex can mark a tech company as cool and cutting-edge. 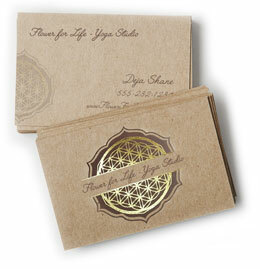 Creative paper stocks can be combined with other special printing effects for a business card that really stands out. SmartFlex works well with die cuts, embossing or perforations. Use die cuts and textured papers to produce pop-ups and folded cards that are true conversation pieces. Creative paper stocks are limited only by your own imagination. Choose one of our custom stocks or really go for it with a special order stock or custom printing effects that will give you a business card unlike anyone else's. Have questions about using custom papers?